Middle East Water Heater Market size will surpass USD 1.5 billion by 2024, as reported in the latest study by Global Market Insights, Inc. 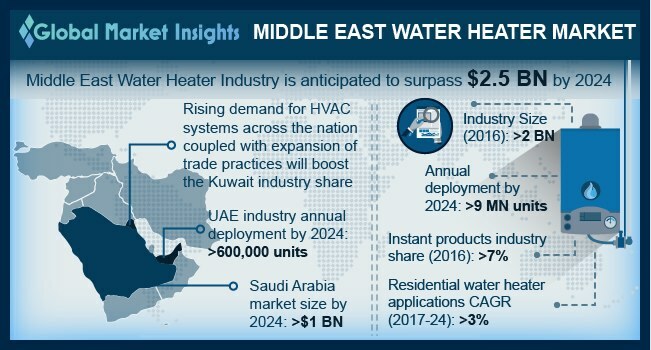 Ongoing expansion of urban areas coupled with growing investments toward existing infrastructure development will foster the Middle East water heater market. Improvement in standard of living owing to significant rise in disposable income will complement the product demand. For instance, in 2018, as per World Population Review nearly 98% of the population in Kuwait is urbanized with an urbanization rate of 2.1% per year. Kuwait water heater market will surpass the deployment of 750 thousand units by 2024. Abundant business opportunities, increasing need for product customization and large pool of potential consumers are some of the key parameters which will positively impact the product adoption. In addition, upsurge in investments toward development of numerous commercial projects will further augment the business growth. For instance, as a part of major construction plan, Kuwait is set to invest USD 160 billion on the island development project over the next 20 years that will include new amusement parks & sport facilities, hotels, shopping & business centers. Increasing adoption of green building solutions owing to consumer inclination toward sustainable systems will stimulate the solar water heater market. Introduction of favorable norms and initiatives with an aim to curtail the carbon emissions will propel the product penetration. As per the leading industry giant, there is a requisite for installing solar energy systems across new-built homes that will enlarge the product landscape. Commercial water heater market will witness an extensive demand for water heating systems owing to increasing investments toward manufacturing facilities. These systems are primarily installed across institutions, healthcare services, hotels, shopping centers & other service establishments. For instance, the government of UAE is anticipated to invest USD 8.4 billion by the end of 2018 toward the development of hotels across the nation. Surging demand for the energy efficient solutions along with sustained electricity prices will foster the Middle East water heater market growth. Government spending toward the implementation of green growth strategies will fuel the product demand. Ongoing measures to upgrade the traditional water heaters will further augment the industry landscape. Qatar water heater market will grow over 4% by 2024. Favorable economic transformations have led the country to become an ideal destination for business & trade purpose. Ongoing government plans toward the development of commercial infrastructure to host two major world class events including FIFA world cup in 2022 will further complement the industry landscape. Declining natural gas prices along with increasing cost of generating electricity from coal will significantly favor the Middle East water heater market. Natural gas acts as the cleanest burning fuel & thus will witness a high demand in future. Government initiatives toward the adoption of natural gas owing to its abundant availability will further accelerate the product adoption. Eminent players across the industry includes Whirlpool, Ferroli, A.O. Smith, Bradford White, Himin Solar, State Industries, Rheem Manufacturing, Rinnai Corporation, Linuo Ritter, Hubbell, Ariston Thermo, Jaquar, Saudi Ceramics, Kanch, Bosch, Viessmann and Haier & Vaillant.